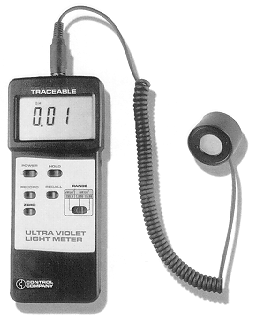 Our new ultraviolet and visible light meter has an overall wavelength range of 320 to 390 nm. The unit is ideal for collecting general-purpose UV measurements for both indoor and outdoor. The meter uses a remote UV sensor with a built-in correction filter to measure UV light in three user-selectable ranges. Accuracy is ®± 2% of full scale for all ranges. The 3-1/2 digit, ½"H LCD indicates when your reading is over the selected range. Features include min/max recall, hold, zero adjust, low-battery indicator, auto off, and RS-232 interface. The meter operates on one 9 V battery (included) and comes with remote sensor, protective holster and instructions. The meter measures 2-7/8"W x 7"H x 1-3/8"D.